We opened Stash in Washington's scenic city of Walla Walla in 2009, with the hope of creating a friendly quilt shop where people could share in each other's creativity. In October of 2010, we moved from our small store location to a larger space on historic Main Street in downtown Walla Walla. When you visit our store, you'll find a welcoming environment full of gorgeous fabrics by Moda, Michael Miller, designers Tula Pink, Amy Butler, Alison Glass, Kaffe Fassett and many more. We also stock a great selection of contemporary garment and quilting patterns. Additionally Stash is proud to be an authorized dealer for BERNINA home sewing, quilting and embroidery machines. From the moment we opened our doors, our customers have been the inspiration for our business. We are fortunate to have a community of talented quilters and sewists who love to share their project ideas and sewing successes with us. They are the reason we strive to offer the finest service and products available! 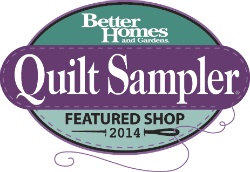 In October of 2013 we found that we had been chosen as a Top 10 Quilt Shop for the Better Homes and Gardens® Quilt Sampler® Magazine May 2014 issue. We are so excited about this honor and we know that it would not have been possible without the support of our great customers. Thank you!